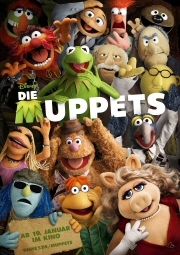 I’m a sucker for the Muppets, but I’m shocked to find this movie in my Top 5. If you’ve seen it, you’re not shocked at all. Consistently inventive, funny, and joyful, The Muppets was made by true Muppet fans, including star and co-writer Jason Segel. Sometimes when the fans take over a beloved property, things go haywire. Being a fan of something and knowing WHY the thing works on you the way it does are two different things. Here, they got it right. Kermit and friends get back together for another show and I’m smiling from ear-to-ear the whole time. Can’t ask for much more than that. This is a movie that I don’t think gets nearly as much love as it should. For my money, it’s the most successful movie Marvel has made thus far. Director Kenneth Branagh showed a real understanding of how to bring the elevated speech of Thor and his world down to a level that’s relatable to the rest of us. It’s a fun, clever and imminently rewatchable movie with great scene after great scene. 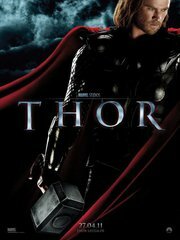 And the two lead performances by Chris Hemsworth as Thor and Tom Hiddleston as Loki leave me very, very excited for what comes next for them in this year’s The Avengers. This is the sad case of an action movie that flew way, way under the radar–probably because its star is a 16-year-old girl. WHO. WILL. KNOCK. YOU. FLAT. Director Joe Wright is a guy who, like Steven Spielberg, always knows where to put the camera. His compositions tell as much of the story as any dialogue. Go back and watch his Pride & Prejudice if you don’t believe me. 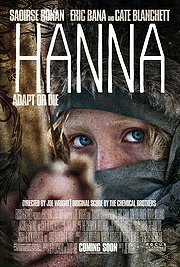 But what really grabs me with Hanna is the way he edited the film and the kinetic energy he put into the action scenes. Wow. You’ve never seen anything like it. Plus: soundtrack by The Chemical Brothers! I have a hard time respecting any Top 10 list of 2011 movies that doesn’t put this movie in there somewhere. Yeah, it’s the 8th film in the series. But, this is where Harry Potter fully grows up and he takes the filmmaking right along with him. This is the whole package, from design to costuming to cinematography to acting to directing. Only one other film in 2011 thrilled me and moved me as much as this one. That’s the only reason this is number 2. It’s criminal that this movie is so underseen. You’d think a sports movie with action this great and with a heart this big would be a MONSTER hit. It deserves to be. I don’t even like sports. I have no use for UFC or MMA or any of that. My wife even less so. And we both loved this movie. That you know the climax of the film within the first 10 minutes doesn’t matter one bit. It’s the character revelations and performances along the way that keep you hooked. This story of two brothers and their recovering alcoholic father devastated me in the best possible way. See this. See this now. * = I saw an edited version of the movie. ** = Movies that just missed my Top 5. Good list Brock, I am still in the process of working on mine. I need to see War Horse and The Girl With The Dragon Tattoo, and then I’ll feel satisfied enough to compile the list. 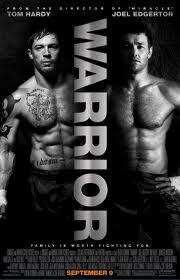 I’m rather stunned to see that Captain America and Super 8 didn’t make your list, while Warrior claimed the top spot. From a marketing standpoint, that film looked like a completely formulaic effort; something I would only think of viewing on Netflix streaming out of desperation or a lack of selection. I will have to check it out now, based on your recommendation. 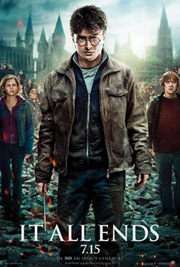 I also enjoyed HP 7-2, but it’s not going to make my top ten list. I didn’t feel the impact that you did. Happy New Year! Jeff, I think you’re going to be pleasantly surprised by Warrior. All the normal conventions and cliches of sports movies are there, but the feel and execution of them is fresh and powerful. It really is a masterfully made movie that reveals itself in bits at a time and doesn’t bother explaining itself at any moment. I look forward to revisiting it. Would love to hear what you think! Captain America and Super 8 were both movies I enjoyed very much, but there was just something missing in both of them–some essential spark that I needed to see to put them on a list. You had me at the Muppets, Brock. Sorry, but the simulated simians in “Rise of the Planet of the Apes” are just too creepy in the commercials for me to ever spend enough time in the Uncanny Valley to watch the movie. Greg, I had the same issue with the Apes in the commercials. Reality just wasn’t there. Then I watched the film. Hoo-boy. Different experience altogether. Man, you saw Tree of Life? If we’re thinking of the same movie, man… That thing was crazy. I didn’t understand it one bit. Well, maybe I did, but I didn’t want to. My fiance and I went to see it with a friend who was into “artistic” movies like that and the only theater in town playing it was, well, an independent artsy theater downtown. He loved and ate it up. My girl and I? Man. Neither of us really liked it. We couldn’t wait to get out of there and do something else, lol. I do admit that I liked some parts of the movie. For example, my favorite part of the entire movie was when it had that sped up representation of the beginning of the universe to the end of the dinosaurs. Because there were some dinosaurs in the movie and dinosaurs rock. And space scenes rock too. And jellyfish. Despite recognizing that those scenes represented macro-evolution and possibly the big bang theory, I found the scenes breathtaking. Although I have absolutely NO idea what it even had to do with the overall story of the family in the movie. lol. As for the other movies, I REALLY wish I had scene most of those but I’ve been so busy and broke it’s crazy. By the way, thank you. Superfogeys, because it’s free online and doesn’t take very long to view, makes up the majority of my free-time spent in pleasure these days. I don’t even have time to pop in a DVD and watch a movie at the house. I tried but the DVD stayed in my computer for a week of me trying to find time to press play, but eventually I had to concede defeat and put it back in the DVD case. I’m just that busy. And that broke. I canceled my box at my local comic shop and I haven’t bought myself a comic in … I have no idea. Over three months? Superfogeys is officially the ONLY comic, web or not, I am still able to find the time and money (due to it being free) to read.